The orthodontist and restorative dentist can work together to improve the occlusion and aesthetics for adult orthodontic patients seeking restoration of worn or abraded teeth. Specifically, patients with anterior tooth wear and compensatory eruption of the abraded teeth present a unique restorative challenge to the general dentist or prosthodontist. When pre-restorative patients are referred to our offices, the most common request from the restorative dentist is to provide more space for restoration of the abraded teeth. What does this mean to the restorative dentist? What should it mean to the orthodontic specialist? How much space is necessary? Which teeth should be intruded? All of these questions must be answered in order to achieve an ideal treatment plan. 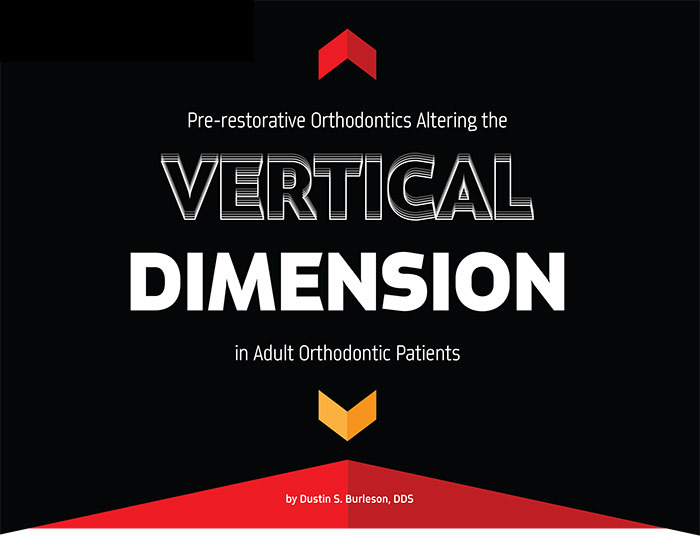 Although orthodontic treatment, especially when combined with orthognathic surgery, can create dramatic changes in the vertical dimension, we must first determine what is necessary in order to achieve our treatment objectives. Although some patients are overclosed and need to have their vertical dimension increased (Fig. 1), many times the diagnosis and resulting treatment plan are inappropriate. The wrong teeth might be intruded or the entire posterior vertical dimension might be inappropriately increased through posterior restorations. In other cases, posterior restorations are indicated. Proper diagnosis and treatment planning are critical to the long-term success of these cases. As orthodontists, we can intrude the maxillary incisors, mandibular incisors or both in order to create the proper vertical space to restore the worn dentition. We can also move gingival margins, eliminate the need for aggressive tooth reduction and improve gingival display on smile. As orthodontists, we enjoy the benefit of treating most of our patients during childhood or adolescence. With facial growth potential, we can easily alter the vertical dimension without the adverse consequences of attempting such treatment in non-growing adults. Through sutural growth at the circummaxillary sutures and condylar growth (Fig. 2), the posterior teeth naturally erupt to fill the space created by ramus elongation as children grow. With adult patients, however, growth is not an option to harness posterior tooth eruption and relative incisor intrusion. We must rely on anterior tooth intrusion or orthognathic surgery to correct vertical dimension problems. Dr. Vince Kokich provides several guiding principles when planning to align teeth orthodontically prior to dental restorations. First, the clinician must locate the occlusal plane. On a cephalometric radiograph, we can draw a line from the contact between the second molars and the upper lip at rest (Fig. 3). Second, we can measure the relationship between the occlusal plane and the maxillary and mandibular incisors. Although the mandibular incisors should be at the level of the occlusal plane, it is anticipated that 2-3mm of incisal display exists below the occlusal plane for the maxillary incisors. Although the amount of incisal display varies with age (0mm for older patients is not uncommon), when the patient's upper incisors are 5 or 6mm below the occlusal plane, the clinician can anticipate intruding these teeth in order to achieve adequate anterior vertical dimension for post-orthodontic restorations. Diagnostic wax-ups can assist the clinician in determining the proper anterior tooth length in cases of severe wear. The third principle is to evaluate the gingival and facial aesthetics after the anticipated tooth movement is achieved. Severely worn incisors might require additional intrusion in preparation for restorations and ideal gingival aesthetics. A 27-year-old Caucasian male presented with a Class II dental malocclusion, mild crowding and midline asymmetry, incisal attrition and subsequent supraeruption of the mandibular anterior teeth (Fig. 4) with 95-100 percent deep overbite and mild excess overjet (Fig. 5). TMJ exam revealed normal range of motion in both opening and lateral excursions, there were no abnormal joint sounds on auscultation and the patient reported no history of jaw joint pain. Gingival health was excellent with no bleeding on probing and the patient continued to see his dentist every four months for prophylaxis during orthodontic treatment. Occlusal examination revealed group function in lateral excursions and heavy occlusion on the maxillary lateral incisors on protrusion (Fig. 6). The patient's past medical history was non-contributory and his chief complaint was to correct his deep overbite in preparation for restoration of his worn mandibular incisors. 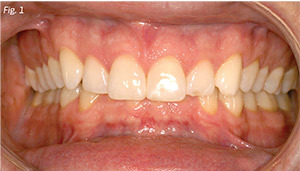 Secondarily, the patient desired to reduce the amount of gingival display on smile (Fig. 7). Following diagnostic records and evaluation of the dental casts, photographs and radiographs with the patient's restorative dentist, it was determined that the maxillary and mandibular incisors would be intruded in order to correct the excessive gingival display on smile, to idealize the maxillary anterior gingival margins and to create space for the restoration of the worn mandibular incisors in order to achieve ideal protrusive guidance and canine-protected lateral excursions in the final post-treatment occlusion. Full maxillary and mandibular fixed appliances were placed with a removable maxillary anterior bite plate (Fig. 8) in order to prevent heavy occlusion on the mandibular fixed appliances. Leveling and aligning was achieved in light copper NiTi archwires in succession from .014 to 19x25 GAC BioForce archwire. 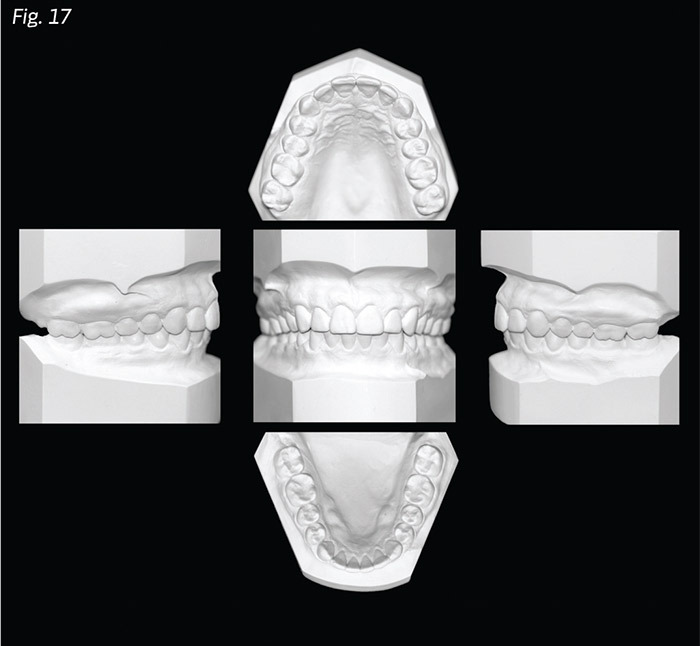 The removable bite plate was discontinued when sufficient anterior intrusion had been achieved in order to prevent heavy occlusion on the lower brackets. Light, short-throw Class II elastics were used on stopped and tied back 19x25 steel archwires in order to minimize posterior vertical extrusion (Fig. 9). Following idealization of the maxillary anterior gingival margins relative to the incisal display on smile, the mandibular incisors continued to undergo detailing and finishing of the space creation for post-orthodontic restoration. Diagnostic wax-ups were completed in order to plan for proper protrusive and canine guidance in the final occlusion (Fig. 10). Finishing was completed in 19x25 TMA coordinated archwires with maintenance of pre-treatment mandibular canine width. The intrusion was maintained in fixed appliances for six months prior to provisional restorations with the prosthodontic specialist. Fixed appliances were removed and final restorations were placed with ideal final occlusion in protrusive guidance (Fig. 11), canine-protected lateral excursions (Figs. 12-13) gingival aesthetics (Fig. 14) and dental alignment (Fig. 15). When patients present challenging vertical dimension problems, the orthodontist and restorative dentist should work together to diagnose and treatment plan which teeth should be intruded, if orthognathic surgery or posterior restorations are necessary, which teeth will be restored, how long the teeth should be maintained prior to restorations, if gingival margins will be altered in the orthodontic alignment, and how all of the planned tooth movement will affect the patient's facial aesthetics on full smile (Figs. 16a-b) and final occlusion (Fig. 17). Dr. Dustin S. Burleson is a speaker, teacher, author and business strategist for hundreds of dentists, orthodontists and medical specialists located in eleven different countries throughout the world. He writes and edits four newsletters monthly, is the director of the Leo H. Rheam Foundation for Cleft & Craniofacial Orthodontics, Assistant Clinical Professor at the University of Missouri - Kansas City School of Dentistry, Attending Orthodontist at The Children's Mercy Hospital and operates a large multi-doctor, multi-clinic orthodontic and pediatric dental practices in Kansas City, Missouri. He is a champion of the private practitioner and has a long track record of helping orthodontists transform their practices and increase their impact on their families, employees, communities and the profession of orthodontics. His orthodontic marketing campaigns have generated over $300 million in revenue for his clients. When he is not working, you can fi nd him on his sailboat, jumping out of airplanes, collecting classic cars or racing exotic supercars in the desert. In a tightly contested vote, he was recently named best dad in the world by two-thirds of his children.